PL Medical Co., LLC offers x-ray cassettes to meet the demanding needs of x-ray technicians. 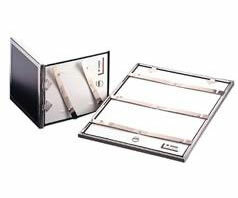 We offer x-ray cassettes in both aluminum push-button and stainless steel cross-bar. Our aluminum push-button cassettes are easy to use, convenient to load and un-load, wafer thin and light weight. An option ID window is available in the standard location for use with conventional daylight ID printers. Our stainless steel cross-bar cassettes feature a stainless steel frame and cross-bars with an aluminum door. Additionally they have an abrasion resistant plastic front. The thick, non-shedding, oil-free felt interior is designed to assure smooth film contact.